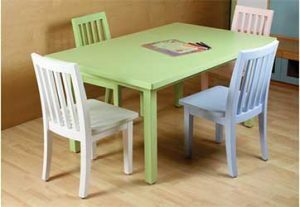 ● Furniture should be functional and ergonomically designed. For example, a study table should be at the right height. ● For storage pieces, practicality plays an important role. This would make the room clutter free. ● A fun piece of add-on furniture is a rocking chair personalised with your little one’s initials. 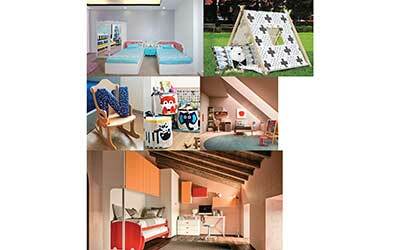 Talking about another trend that is here to stay is personalisation. 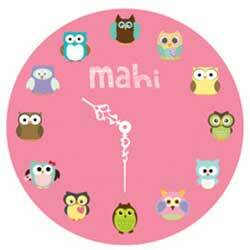 Mithila further adds, “You can never go wrong with adding fun, personalised accents across a kid’s room. Spell out your kid’s name with attention-grabbing, alphabetshaped cushions in bright fabrics or coloured wooden letters. A name plaque at the entrance door, a pretty wall clock or a funshaped cork board will add charm and personality in your little ones space.” Experimenting with different materials like denims for blinds is also a big hit. 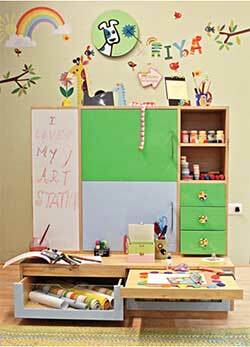 A kid’s room is susceptible to having paints, colours and pencil marks on different things, especially on furnishings. Hence, Ayushi advises purchasing furnishings that are machinewashable without fading out. 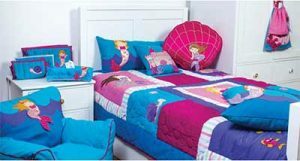 She further adds, “In terms of bedsheets, one can go for the anti-bacterial one which will safeguard your kid from rashes.” “Usage of organic fabrics and natural dyes are in vogue. These are safe for a child’s sensitive skin. Easy maintenance fabrics take frequent washes—that helps in maintaining your child’s hygiene,” says Garima. Ayushi advises, “It wouldn’t be wise to spend a lot on furnishings in a kid’s room since we know that at some point there will be crayon or paint stains. Hence, opting for rough and tough materials that is machine-washable should be the way to go.” Have an array on display in your child’s room. From bedding and cushions to rugs and fancy clocks, you can get creative. Despite having one too many items, try not to splurge. ● A good window treatment is important to complete the look of the room. The colours of the curtains have to be co-ordinated mainly with the walls. ● It is important that all the paraphernalia of the interior is organised well. 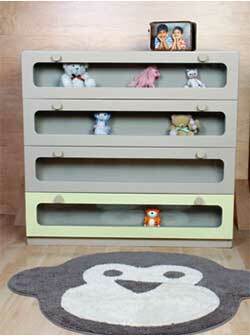 ● A toy shelf or bookshelf just above their bed can meet their discerning demands. ● Experiment with lights, incorporate rugs or carpets to enrich dull floors. Also, you can furnish with interesting tiles for a more colourful outlook..